Group show Feminist and ... strives for diversity but succumbs to obfuscation. Curator Hilary Robinson claims that the ellipses in the title allow "openness, inclusion, and spilling over," but her broad definition does little to tie the show's works together. 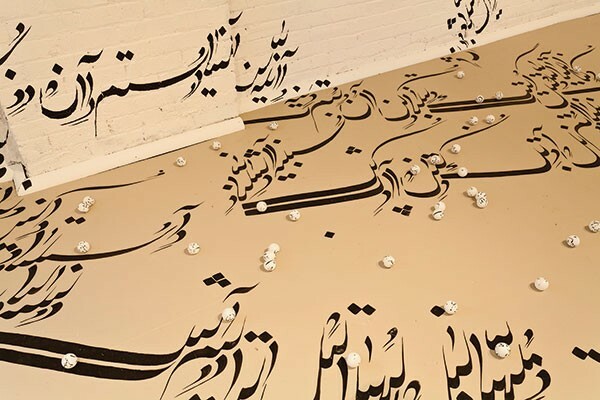 The painted word: Parastou Forouhar's "Written Room." Given the misogynistic rhetoric of the most recent election cycle, it is clear that feminism still has a crucial role to play in American politics. Last November, women voted in record numbers, and more women than ever were elected to Congress. And while people in the United States debate women in combat, women's rights and gender equity are becoming a global conversation, especially in places where discussing sexual harassment and violence against women has previously been considered taboo. Women's rights are inextricably linked to issues surrounding development, poverty, security, social justice and the environment. According to art historian Hilary Robinson, "feminism is a set of politics, dedicated to the analysis of gender and the liberation of all women in support of the improvement of all humankind. To be feminist is to be actively involved with a process of thinking and acting and engaging with the whole world." As curator of the exhibition Feminist and ... , at the Mattress Factory, Robinson — a former Carnegie Mellon University College of Fine Arts dean who recently returned to her native England — aims to demonstrate that feminism is "multi-vocal, multi-generational and multi-cultural." The exhibition presents new work, created during residencies this past summer, by six women from three different countries and of different generations. Betsy Damon was active in the Women's Movement in the 1970s. 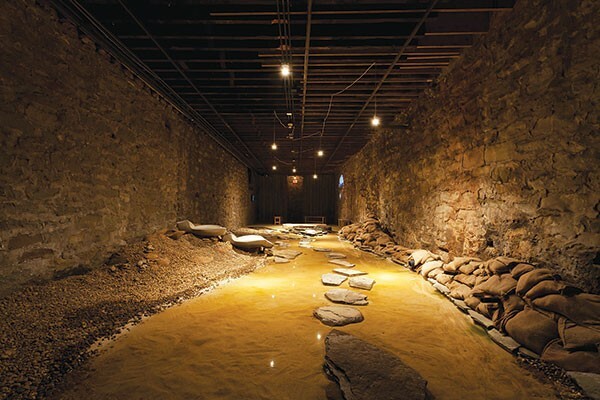 Her "Water Rules — Life, Pittsburgh: Seeking Lost Rivers, Living Waters of Larimer" fills an entire room in the basement. It could be interpreted as Zen garden, rivulet, tide-pool or flood. In 1991, Damon founded Keepers of the Waters, an organization that focuses on water stewardship. For this project, Damon researched Pittsburgh's topography, its rivers, its water systems and its wastewater treatment. Her project includes Living Larimer, a model for gathering rainwater that will help prevent devastating floods in an economically struggling urban area. 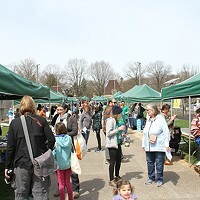 Loraine Leeson's video installation "Active Energy: Pittsburgh" also focuses on the regeneration of the urban environment through sustainable practices. Several screens show members of the Geezers Club, a group of British retirees who have contributed their knowledge to intergenerational projects related to renewable-energy options for underserved communities. Paired with these images are interviews with older adults from Pittsburgh who are struggling with dementia. While the installation seems to be about giving voice to disenfranchised seniors, the connection between these two groups is not entirely evident. Live streaming: Betsy Damon's "Water Rules — Life, Pittsburgh: Seeking Lost Rivers, Living Waters of Larimer"
Similarly obscure is Parastou Forouhar's "Written Room," where words in Persian script are written all over the walls, ceiling and floor, as well as on ping-pong balls strewn about. The piece is meant to comment on the exoticization of the "oriental," since the words are merely ornament for those who do not understand the language. But the words themselves are fragments, confounding any perceptible meaning even if one does understand the language. Ayanah Moor is also interested in muddling words through appropriation, revision, expansion and inversion. In her room-size installation "by and about," she uses words of and about the poet Nikki Giovanni, the singer Billie Holiday, the painter Mickalene Thomas and others in a rich wash of burgundy screen-printed on layered newspapers. Carrie Mae Weems also samples words, through audio and video clips, in "Lincoln, Lonnie and Me — a Story in 5 Parts." In this video-based installation, life-sized spectral figures are projected using a "Pepper's Ghost" technique onto a red-velvet-draped proscenium. While the works by Leeson, Forouhar, Moor and Weems are all subtle to the point of obfuscation, Julia Cahill's "Breasts in the Press" is comparatively too obvious. Projected onto an outrageously well-endowed reproduction of the Venus de Milo are videos that explore sexual imagery in popular media. As the youngest artist in the exhibition, Cahill is genuinely earnest, but her piece exposes the flaws of the exhibition as a whole. Robinson has set out to rectify what she sees as the faults of many recent "feminist" blockbuster exhibitions that consider "feminist art" as historic, or ignore multicultural or global feminism, or try to define it as a single category limited to a specific time, place, style and aesthetic. But while Robinson claims that the ellipses in her show title allow "openness, inclusion, and spilling over," her broad definition does little to tie these works together. The exhibition's diversity is hindered by the fact that there are only six works — all by female artists — from only three different countries. In an abstract for her panel Feminism Meets the Big Exhibition: 2005 Onward, at February's College Art Association Conference, Robinson writes "this period is pivotal for feminist curating ... to welcome the next iterations of feminism in the art world." Unfortunately, her show is so poorly curated that it adds little to the conversation.